Heat pumps do tend to makes strange and/or loud noises at times, more so in the winter. Heat pumps have reversing valves that reverse the flow of refrigerant between the heating and cooling modes. During the winter, whenever the heat pump goes into the defrost mode, this valve shifts. Along with that comes a "wooshing sound", which usually lasts for a couple of seconds. After that, the compressor sometimes sounds much louder than usual, almost a "tinny sound". After shutdown the refrigerant pressures equalize, during this period sounds can sometimes be heard, but this is normal. Another common loud sound is when the outdoor unit starts up or shuts off. Specifically, the newer "Scroll" type compressors tend to make a "back-peddling" type of noise on shutdown. And on start-up, they sometimes sound like an "out-of-balanced washing machine". Sometimes customers complain of a "buzzing" noise coming from the outdoor unit, even when it's not running. This is usually caused by the reversing valve solenoid coil. It's usually a low voltage device (24 volts) and some are just louder than others - and in most cases, this is normal. 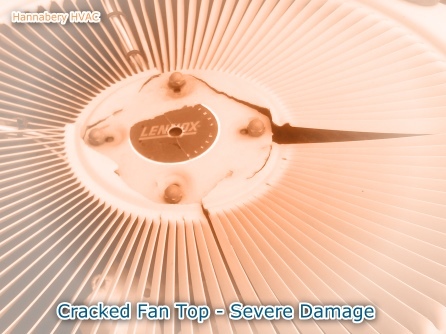 If you are hearing a very loud "metal-hitting-metal" type of sound, the fan blades could be hitting something; possibly ice, or a wire, or tubing. Take a look and shut the unit off immediately. 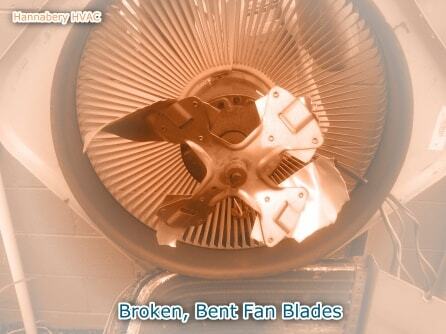 This almost always ruins the fan blades and possibly the motor as well. 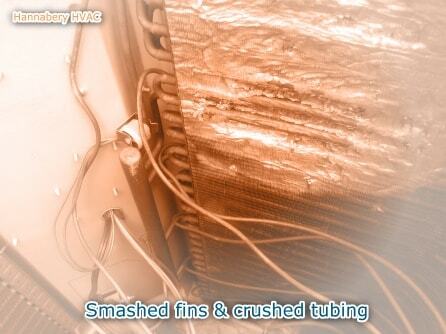 If a piece of copper tubing shifted and is being hit by the blades, they could cut a hole in it causing the refrigerant to leak out. If the fan blades bend or break, they can smash the aluminum fins and copper tubing on the coil - essentially ruining your outdoor unit. Then there are always the "vibration" type of noises, which may sound simple, but can be the most difficult to eliminate. Sometimes it is just a matter of installing rubber isolation pads under the unit. Sometimes the refrigerant piping is strapped too tightly to the joists or studs in the home. Sometimes it is in the unit itself and just cannot be eliminated. Vibration due to loose parts.